The May Flight Attendant schedule month is a 30-day month, beginning Thursday, May 2nd, and ending Friday, May 31st. Domestic line averages are similar compared to April and slightly higher in the International package. Line averages are between 79:41--84:14 hours among crew complements. An increase in all-nighter/red eye turns and increased frequency of high time turns, allowing the committee to build more consistent day of week turn lines. Line averages are between 78:27-85:31 hours among the crew complements. IAH is assigned 4 positions daily on the late LHR flight. May was a little more challenging than usual for building lines. There are four dates of Backstage and two holidays, Mother's Day and Memorial Day, to build around. Attempting to build as many clean lines as possible for Reserves while accommodating the company's requests for adequate coverage was slightly more difficult. We did have requests for more 6-day availability stretches to help when bidding around vacation so, you may see more than usual. Your AFA local schedule committee appreciates feedback and is happy to answer any questions you may have regarding line construction. Feedback/inquiries can be sent to cwise@unitedafa.org. A complete system-wide scheduling report is available from the Central Schedule Committee (CSC) on the unitedafa.org website. 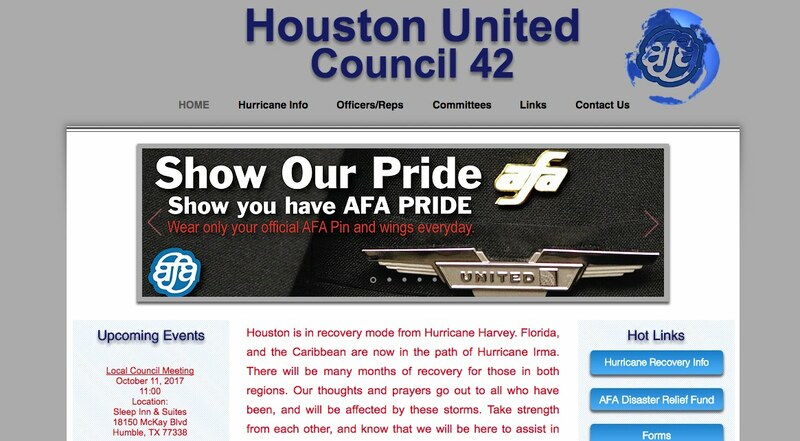 Below are your AFA Council 42 schedule committee members.